I have been researching how to tag my digital photos for easier categorization and searching. Sites like Flickr allowing tagging of uploaded photos, but I want the tags on the original files. And I want them embedded in the files, so that tags are retained when moving the files to another computer. This write-up applies to JPEG files, although it sounds like TIFF files can also be handled in much the same way. Note that below I will refer to “metadata tags”, which are the labels used to identify individual pieces of metadata stored in a photo file. These should not be confused with the categorization/search tags I want to add to the photos. The categorization/search tags are sometimes referred to as keywords, and to avoid confusion that is how I will refer to them from now on (for the most part). JPEG image files provide an area for applications to store metadata like title, date taken, shutter speed, etc. There are several slots available, each of which holds a group of metadata tags. The “APP1” slot holds metadata defined by the Exif standard. The “APP14” slot holds metadata defined by the IPTC standard. The Exif metadata tags and the IPTC metadata tags do not overlap for the most part – they were designed to store different types of metadata (see references). There is also a new XMP standard which can store the same metadata as Exif and IPTC. It sounds like XMP was created as a replacement for Exif and IPTC, although all three types of metadata can co-exist in one file. I haven’t had any experience using XMP, and I am not sure if having XMP metadata complicates things. For example, I am not sure how Windows or Flickr would react if keywords were present in both the XMP and the IPTC metadata. Since cameras generally do not store XMP metadata, I am not going to worry about it. The standard place to store keywords is in the IPTC slot under the “Iptc.Application2.Keywords” metadata tag. So far, all of the software I have experimented with follows this standard. Keep in mind that when you edit photo metadata you are actually editing the file. If the photos are important to you, I encourage you to make backups before editing them. And when you are learning or evaluating editor software for the first time, I suggest you practice on copies of files that are OK to trash. This capability existed at least as far back as Windows XP. You can do batch editing by opening the properties dialog box while multiple files are selected. The Windows built-in editor gets the job done, but it can be tedious if you need to go through many photos and tag or title them one by one. Ubuntu 12.04’s file property dialog box also shows image metadata, but it does not allow you to edit the metadata. So, unless there is some functionality I am missing, you will need to use 3rd party software for editing. 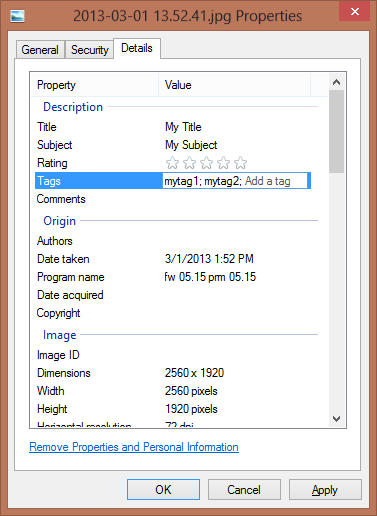 There are many GUI programs out there for tagging photos and editing metadata. I am on the lookout for a piece of open source software, but haven’t found one yet that exactly meets my needs.